• Extended top of head and chin protection. • Large superior-quality visors for maximum visibility. • Easily replaced visors available in different materials, tints and finishes to better suit individual needs. • Comfortable fit with goggles or respirators. • Locking mechanism for more complete safety. • Dielectric design. • Incredible adjustability (2784 possible wearer positions). • Fully adjustable ratchet headgear. • Fully adjustable headband. • Multiple visor tilt positions. • Extra soft cushioning on all parts of the shield in contact with the head. • Breathable extra-soft sweatband is removable for easy washing and replacement. 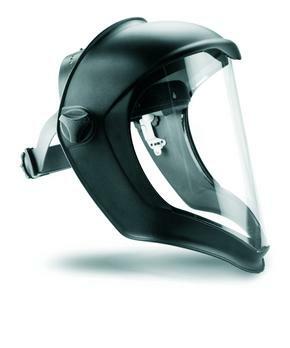 Through its many adjustable features, the Bionic faceshield gives the most comfortable fit in the industry.